After taking a week off, "Saturday Night Live" returned to the air and continued to needle President Donald Trump and his top staff. The Feb. 4 episode featured actress Kristen Stewart	as the guest host with singer Alessia Cara serving as musical guest. Alec Baldwin assumed his regular role this season to portray Trump, but a surprise appearance by Melissa McCarthy stole the show. The cold open wasted no time, greeting viewers with a "tired and cranky" Trump wrapping up a long day in the Oval Office. 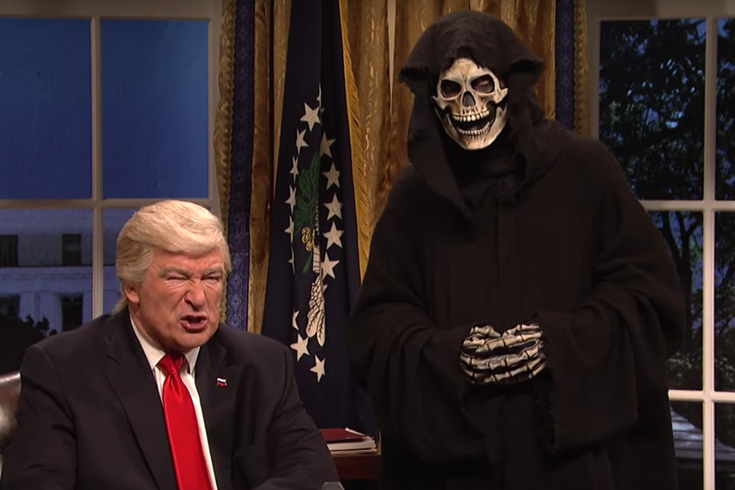 Trump summoned chief strategist Steve Bannon, who was portrayed as the Grim Reaper, to inquire whether anything was left on the day's agenda. Bannon ominously suggested that Trump call some world leaders. Unsurprisingly, the phone calls with Australia Prime Minister Malcolm Turnbull, Mexico President Enrique Peña Nieto, Germany Chancellor Angela Merkel and an unnamed leader of Zimbabwe were cringeworthy. Satisfied by the disastrous attempts at diplomacy, Bannon decided "that's enough fun for tonight" and asked for his desk back. Trump quickly obliged, referred to Bannon as "Mr. President," and moved to a tiny desk to play with a children's toy. Later in the show, McCarthy's impression of White House press secretary Sean Spicer had social media buzzing. McCarthy's Spicer immediately set the tone for the press conference, screaming "Settle down! Before we begin, I know that myself and the press have gotten off to a rocky start. In the sense, when I say "rocky start," I mean Rocky the movie because I came out here to punch you in the face. Also, I don't talk so good." Reporters clashed with Spicer over Trump's nominee for the U.S. Supreme Court, the travel ban of people from seven Muslim-majority countries, Bannon's role in the National Security Council and Betsy DeVos' selection for the Education Department.